The Autonomies Collective has assumed no open position on the “Rojava Revolution” for reasons of ignorance. In the absence of consistent information on what is happening in the region, as well as its complexity, we have abstained from judging or evaluating events. But equally convinced of the potential of the political processes and struggles that have emerged, we share the following testimonials, to keep the debate alive and in solidarity, to diffuse views and knowledge which may help to better understand. The battle over Kobanê, which began in the summer of 2014, has brought to the world’s attention the Kurdish resistance to the brutal forces that call themselves Islamic State (IS or ISIS). Contrary to the expectations of many, the defense forces have succeeded in fending off the attacks not only of ISIS, but also the al-Nusra Front and the Assad regime over the last two and a half years. Less well known, however, is the fact that residents of the predominantly Kurdish areas of northern and northeastern Syria have established themselves as a new political entity that they call Rojava, comprising three autonomous cantons, one of which is Kobanê. There they have undertaken, to all appearances, a social and political revolution, characterized by remarkable efforts towards gender liberation and direct democratic self-government. On December 1, we crossed the Tigris from the Kurdistan Regional Government (KRG) in northern Iraq and entered Cizîre canton. During the next nine days, we visited its major cities as well as rural villages. We attended a meeting of a self-governing people’s council in a Qami?lo neighborhood. We spoke to representatives of TEV-DEM, the broad-based Movement for a Democratic Society that constructed the institutions of self-government. We met with journalists, members of political parties, such as the Democratic Union Party (PYD), and others. We were guests at the large Mesopotamia Academy of Social Sciences in Qami?lo, where we also met with the teachers union. Prior to the revolution, under the Syrian state’s severe policies of assimilation and Arabization, the Kurds were not allowed to speak their own language, give their children Kurdish names, open shops with non-Kurdish names, found private Kurdish schools, or publish Kurdish books or writings. The mainly Kurdish-populated regions had no possibility to establish a university. In order to study, students had to leave the region for Aleppo, Damascus, Deiraz-Zor, Hama, or Homs. But recently Rojava’s self-government has taken the first steps toward creating a university. We visited the Newroz refugee camp, where Yezidis from Mount Sinjar emphasized their ambitions for self-governance and self-defense, and pleaded for international assistance. The refugees emphasized that they suffer under the embargo imposed on Rojava, lacking basic needs. The Yezidis told us that they feel that their suffering is being instrumentalized by entities like the Kurdistan Regional Government (KRG), various states, including the coalition forces, and international organizations like the UN, repeatedly stressing that the YPG (People’s Defense Units) and YPJ (Women’s Defense Units), as well as the PKK guerrillas had rescued them from Mount Sinjar in August 2014 and provided them with their basic needs ever since, in spite of the embargo and the war in Kobanê. Across the canton we could see scars from decades of oppression and from the recent battles against al-Nusra and ISIS. We spent time with representatives of Rojava’s defense forces. We met with the military command of the YPG in Sêrêkaniye, and with the Amûde branch of the YPJ. We visited a training academy for the internal security force, or Asayî?, in Rimelan. Although we come from various backgrounds, we share some impressions from our journey. Rojava, we believe, points to an alternative future for Syria and the Middle East, a future where the peoples of different ethnicities and religions can live together, united by mutual tolerance and common institutions. Kurdish organizations have led the way, but they increasingly gain support from Arabs, Assyrians, and Chechens, who participate in their common system of self-government and organize autonomously. Wherever we went, members of the self-government and the armed forces insisted that any viable political alternatives for the region had to be based not on revenge but on shared interests and mutual trust. We met members of the Asayî?, the internal security units, as well as of YPG, and YPJ, who were Kurds, Chechens, Syriacs, and Arab, all of whom emphasized that they seek common solutions for all peoples of the region. They face daunting challenges, but we are convinced that their aspirations are sincere. First, Rojava exists under an economic and political embargo imposed by its neighbors Turkey and the Kurdistan Regional Government in Iraq. Its economy, infrastructure, and defense all suffer from the resulting isolation. Even though the KRG has opened the Semelka (Fishkhabour/Peshkhabour)border crossing for limited trade and personal transport since the Duhok agreement in October 2014, it decides over the border crossings arbitrarily and holds back humanitarian aid for Rojava, including the refugees at the Newroz camp. Even books for the Mesopotamia Academy cannot cross the border. The embargo strangles the capacity of the self-government to provide the population even with medical aid and basic humanitarian resources. It is imperative that the embargo be lifted. International pressure must be exerted on Turkey in particular to open its border crossings so that food, materials, medicine, and aid can get through. Interview with Janet Biehl by journalist Cesur Milusoy (23/12/2014). Janet, you just returned from a journey to Rojava that lasted more than a week. How did you and the group enter Rojava? The Turkish border is closed, and ISIS controls much of the territory in Iraq. We started out from Erbil, Iraq, and crossed the border at Semalka. The organizers had arranged for the crossing in advance. Once we arrived, we had to wait a few hours until someone made a telephone call. Then we crossed the Tigris and entered Cizire. Cizire is a small canton in Syrian Kurdistan that is at war and at the same time is daring to build something new. To ask a banal question, what were your impressions? Rojava seemed to me to be poor in means but rich in spirit. The people are brave, educated and dedicated to defending their revolution and their society. Their revolution is grassroots-democratic, gender equal, and cooperative. I’ve never experienced anything like it. The people of Rojava are showing the world what humanity is capable of. You went to Rojava to see whether the self-government functions along libertarian principles. What did you find? To what extent are the principles of Murray Bookchin present? Rojava’s system is similar to Bookchin’s ideas in the most crucial way: power flows from the bottom up. The base of Bookchin’s system is the citizens’ assembly. The base of Rojava’s is the commune. One of my questions before arriving was whether Rojava’s communes were assemblies of all citizens or rather meetings of their delegates or representatives in a council. But I found out that the communes are made up of a neighborhood’s households, and that anyone from those households may attend and participate in a meeting. That’s an assembly. Another similarity is that in both systems power flows upward through various levels. Citizens’ assemblies can’t exist in isolation—they have to have a mechanism by which they interconnect with their peers, yet one that remains democratic. Rojava’s solution is the people’s council system that rises through several tiers: the neighborhood, the district, the city, and the canton. Bookchin, by contrast, spoke of towns and neighborhoods confederating. Murray called the broader levels “confederal councils,” where as in Rojava they are called people’s councils at every level, or even “house of the people.” In both cases they are made up of mandated delegates, not representatives as in a legislature. Rojava’s delegates—called co-presidents—convey the wishes of the people the next level up–they don’t act on their own initiative. So that’s another similarity. In Rojava, the people’s councils aren’t made up only of co-presidents from the lower levels; they also comprise people elected to enter at that level. The councils seem to be quite large. I think that’s a good idea. In addition to the council system, Rojava has a transitional government in place as well, a built-in dual power. The council system is separate from it but also carries the wishes of the people into it, through various mechanisms. You have also spoken about the revolutionary process there. Bookchin wrote extensively about the revolutionary process, in his histories of revolutionary movements. You can’t make a revolution just any day, he would point out; history has to be on your side; only at times does a “revolutionary situation” develop, when it’s possible to change the system. He lamented that all too often, when a revolutionary situation came around, the revolutionaries weren’t ready for it. They longed for an opportunity to make change, but they did not organize in advance, and so when the revolutionary situation developed, they missed their chance. Rojavans did not make the common mistake. They prepared for decades before the revolutionary situation happened, building counterinstitutions, creating a structured counterpower. The Qamislo massacre of 2004 taught them that they had not prepared sufficiently, so they intensified their preparations. So when the revolutionary situation came in 2012, they were ready. When the regime collapsed, leaving a power vacuum, the counterinstitutions were in place to take the power, and they did. Rojavans understand something else Murray argued too, about power. The issue is not to abolish power—that can’t be done. The issue, is rather, to define who has the power: will it be a regime, or will it be the people? Rojavans understood when the moment arrived that the power was theirs for the taking, and they took it. He would have applauded heartily. And finally, I think he would have commended the work of Tev-Dem, a movement of civil society organizations established in order to create the council system—communes and other institutions of democratic self-rule. I think he would have commended Rojavans’ imagination in inventing a movement whose purpose is to create democratic self-government. You speak of creativity that Bookchin would have praised, but the creativity is essentially Abdullah Öcalan, head of the Kurdistan Workers Party (PKK), who was inspired by some writings of your partner, as was the Syrian branch of the PKK, the PYD. The PKK is originally based on Marxist-Leninist ideology. Did you observe any signs of this in Rojava? In the past decades Öcalan and the PKK have renounced Marxism-Leninism. Their goal is now to create a base democratic, ecological, cooperative, and gender-equal society. I saw no gulags there, not even close. I saw a place that seemed genuinely committed to creating that society, even if it’s still at work in progress. The equality between men and women is an important issue for you. In the Middle East women have a difficult role. Has that changed in Rojava? Misogyny is deeply rooted in the Middle East. Women have fewer rights there than almost anywhere else in the world. Their intelligence end value are denigrated. They may be married while still girls. Their husbands can beat them with impunity, and husbands can have plural wives. And when a woman is sexually abused, her male relatives blame her and may commit an honor killing or even coerce her into committing an honor suicide. She is often excluded from education and from working outside the home, and she is certainly forbidden to participate in public life. In Rojava this grim condition is undone, as the whole society is committed to creating equality for the sexes. Girls are educated along with boys. They can choose any profession. Violence against women is forbidden. A woman who experience domestic violence can bring the problem to a public meeting, where it is discussed and investigated. Above all they may participate in public life. In Rojava’s democratic self-government, a meeting must consist of 40 percent women. The institutions have no individual heads—they must always have two co-presidents, one man and one woman. An elaborate series of women’s councils exists alongside the general councils. Women’s councils have veto power over decisions that affect women. Rojava’s defense forces consist of units for men and units for women. Do women play a large and more important role in the revolution, without which these structures would not be possible? Yes. In many places we were told that Rojava’s revolution is a women’s revolution; that a revolution that does not alter the status of women really isn’t a revolution at all; that transforming the status of women transforms the whole society; that freedom for women is inseparable from freedom of society; and even that women are “the main actors in economy, society, and history.” Such ideas are taught not only in the women’s academies and the Mesopotamian Academy but also in, for example, the academies that train the defense and security forces. At the Asayis academy in Rimelan, we were told that half the educational time is dedicated to equality of the sexes. One cause of conflict in the Middle East is the oppression of ethnic groups. In Rojava many cultures and religions exist alongside each other. How freed do you think the minorities are in the self-government? Did you have an opportunity to speak to any of the remaining Christians? It seems to me that Rojava’s Kurds understand very well the importance of this question, since they very well know the experience of being an oppressed minority. Today as the majority in Rojava they know that it would be unacceptable for them to impose on others the kinds of exclusions that they experienced in Syria and that they still experience elsewhere. One aspect of Rojava’s diversity is the Assyrian Christian community. What is the situation for them in Qamislo? We met a group of Assyrians in Qamislo, who explained to us that the Baath regime and recognized only Arabs as the sole ethnicity in Syria. Like Kurds, Assyrians had no cultural rights and were barred from organizing a political party. But in the summer of 2012 the revolution founded the self-government, and since then the Assyrians have experienced both improvements in their condition. The revolution established three official languages; Kurdish, Arabic, and Soryani (the Assyrians’’ language). Assyrians even have their own defense unit, the Sutoro. Of course, our delegation couldn’t examine the whole society under a microscope. But we asked the group of Assyrians what difficulties they experienced with the self-government. They responded that they have no difficulties. They participate in the people’s councils at all levels. We learned that in the transitional government each minority must have 10 percent of the seats in parliament, even when they don’t have 10 percent of the population. That’s positive discrimination. Most important, the Assyrian women have organized themselves. They believe that women are essential to democracy, and that democracy is essential to women. “Self-government means,” said one Assyrian woman, “that women are more effective and can participate and can learn to become leaders. … We have in common with Kurdish women the wish to defend the society. … We have relations with Kurdish and Arab women … The Assyrian Women’s Organization also includes Arab women. We want to improve the condition of all women in this area, not only Assyrian women. It is one further splendid aspect of this “women’s revolution”: women of all ethnicities share the same problems from traditional society. In Rojava the equality of the sexes ties women together across ethnic lines, bringing everyone closer together. What is daily life like? Are schools, doctors, electricity, and water all supplied for free? Rojava has been fighting a long, grueling war of self-defense against ISIS, and to that end the self-government maintains defense forces (YPG, YPJ) and security forces (Asayis). Arming these men and women, providing them with food and uniforms, and meeting other military needs consumes 70 percent of the budget. The remaining 30 percent goes to public services. Rojava considers health and education to be basic human needs, and on that slim budget, it finances public systems for both. The main economic activity in Cizire is agriculture. With its fertile soil and good growing conditions, the canton is rich in wheat and barley. Before the revolution it was the breadbasket of Syria. Notably, the Baath regime declined to build processing facilities in Rojava, even flour mills. The self-government built one only recently, at Tirbespiye, and now provides flour for the whole canton. Bread remains the staff of life—each household gets three loaves of bread a day, which the self-government provides at 40 percent below cost. For the last two years the self-government has supplied seeds to the farmers, and diesel for their machinery, so they can continue to cultivate their lands. The self-government has also created local companies to develop infrastructure and to build roads. And it finances the refugee camps in the Kurdish areas. Humanitarian institutions are present there too, but only symbolically—they don’t finance electricity, water, or education, because Rojava is not internationally recognized; the agencies have to work through the KRG and Damascus, which doesn’t allow it. So Rojava must provide for them. The result is an economy of survival. Electricity and clean water are in limited supply. Still, at the top of the economic development agenda is the creation of cooperatives, in Rojava’s “community economy.” “Our political project and our economic project are the same,” said Abdurrahman Hemo, an adviser for economic development in Cizire canton. For two years Cizire has been promoting cooperativism through academies, seminars, and community discussions, and is building them in different sectors. Most of the cooperatives are agricultural, but others are springing up in trades and construction. What is Rojava’s income? Do people pay taxes? Rojava collects no taxes from its people, and receives a small income from the border crossing at Semalka. But most of Rojava’s income by far comes form Cizire’s oil. The canton has thousands of oilfields, but at the moment only 200 of them are active. Once again, the Baath regime exploited Cizire’s raw materials but refused to construct processing plants. So while Cizire has petroleum, it had no refineries. Only since the revolution has the self-government improvised a large refinery to produce diesel and benzene, which are sold cheaply in the local economy. Diesel is now cheaper than water—it fuels the small generators that provide power in much of Cizire. But the canton exploits petroleum only for its own use. Why can’t Rojava just sell its oil abroad and gain income from exports? The reason is the embargo. Rojava shares a long border with Turkey, and several border crossings exist. But they are officially closed now, since Turkey embargoes Rojava both politically and economically. The KRG observes Turkey’s embargo, although it has relaxed in recent months to allow trade through the Semalka crossing. But because of the virtually complete embargo, Rojava must build everything itself, from local materials. It gets no investment from outside–all production and all consumption are domestic. Self-sufficiency is not ideology—it’s an economic reality. Is the self-government sustainable? Can it survive? Or does it depend on the outside, that is on the political power game of Turkey, the United Stats, and so on? Or is there an opportunity that one could call historic? But outside investment is lacking, because Rojava’s existence is not internationally recognized. Potential investors have no legal access—they have to go through the KRG and Damascus. And they have no physical access—the absence of border crossings with Turkey. To survive, Rojava needs openings to the outside world. It seems clear that Turkey must open its borders and allow this noble and high-minded project to continue. This interview with David Graeber was published by the Turkish daily Evrensel. Professor of Anthropology at the London School of Economics, activist, anarchist David Graeber had written an article for the Guardian in October, in the first weeks of the ISIS attacks to Kobane (North Syria), and asked why the world was ignoring the revolutionary Syrian Kurds. According to Graeber, the autonomous region of Rojava declared with a “social contract” in 2011 as three anti-state, anti-capitalist cantons, was also a remarkable democratic experiment of this era. In early December, with a group of eight people, students, activists, academics from different parts of Europe and the US, he spent ten days in Cizire -one of the three cantons of Rojava. He had the chance to observe the practice of “democratic autonomy” on the spot, and to ask dozens of questions. Now he tells his impressions of this trip with bigger questions and answers why this “experiment” of the Syrian Kurds is ignored by the whole world. In your article for the Guardian you had asked why the whole world was ignoring the “democratic experiment” of the Syrian Kurds. After experiencing it for ten days, do you have a new question or maybe an answer to this? Well, if anyone had any doubt in their minds about whether this was really a revolution, or just some kind of window-dressing, I’d say the visit put that permanently to rest. There are still people talking like that: This is just a PKK (The Kurdistan Workers’ Party) front, they’re really a Stalinist authoritarian organization that’s just pretending to have adopted radical democracy. No. They’re totally for real. This is a genuine revolution. But in a way that’s exactly the problem. The major powers have commitment themselves to an ideology that says real revolutions can no longer happen. Meanwhile, many on the left, even the radical left, seem to have tacitly adopted a politics which assumes the same, even though they still make superficially revolutionary noises. They take a kind of puritanical “anti-imperialist” framework that assumes the significant players are governments and capitalists and that’s the only game worth talking about. The game where you wage war, create mythical villains, seize oil and other resources, set up patronage networks; that’s the only game in town. The people in Rojava are saying: We don’t want to play that game. We want to create a new game. A lot of people find that confusing and disturbing so they choose to believe it isn’t really happening, or such people are deluded or dishonest or naive. Since October we see a rising solidarity from different political movements from all over the world. 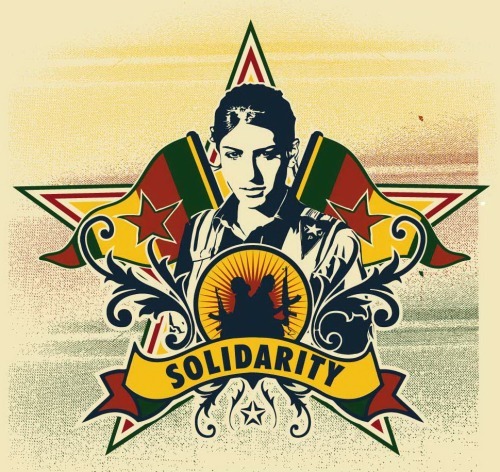 There has been a huge and some quite enthusiastic coverage of Kobane resistance by the mainstream medias of the world. Political stance regarding Rojava has changed in the West to some degree. These are all significant signs but still do you think democratic autonomy and what’s been experimented in the cantons of Rojava are discussed enough? How much does the general perception of “Some brave people fighting against the evil of this era, ISIS” dominate this approval and the fascination? I find it remarkable how so many people in West see these armed feminist cadres, for example, and don’t even think on the ideas that must lie behind them. They just figured it happened somehow. “I guess it’s a Kurdish tradition.” To some degree it’s orientalism of course, or to put simple racism. It never occurs to them that people in Kurdistan might be reading Judith Butler too. At best they think “Oh, they’re trying to come up to Western standards of democracy and women’s rights. I wonder if it’s for real or just for foreign consumption.” It just doesn’t seem to occur to them they might be taking these things way further than “Western standards” ever have; that they might genuinely believe in the principles that Western states only profess. You mentioned the approach of the left towards Rojava. How is it received in the international anarchist communities? The reaction in the international anarchist communities has been decidedly mixed. I find it somewhat difficult to understand. There’s a very substantial group of anarchists -usually the more sectarian elements- who insist that the PKK is still a “Stalinist” authoritarian nationalist group which has adopted Bookchin and other left libertarian ideas to court the anti-authoritarian left in Europe and America. It’s always struck me that this is one of the silliest and most narcissistic ideas I’ve ever heard. Even if the premise were correct, and a Marxist-Leninist group decided to fake an ideology to win foreign support, why on earth would they choose anarchist ideas developed by Murray Bookchin? That would be the stupidest gambit ever. Obviously they’d pretend to be Islamists or Liberals, those are the guys who get the guns and material support. Anyway I think a lot of people on the international left, and the anarchist left included, basically don’t really want to win. They can’t imagine a revolution would really happen and secretly they don’t even want it, since it would mean sharing their cool club with ordinary people; they wouldn’t be special any more. So in that way it’s rather useful in culling the real revolutionaries from the poseurs. But the real revolutionaries have been solid. What was the most impressing thing you witnessed in Rojava in terms of this democratic autonomy practice? There were so many impressive things. I don’t think I’ve ever heard of anywhere else in the world where there’s been a dual power situation where the same political forces created both sides. There’s the “democratic self-administration,” which has all the forms and trappings of a state -Parliament, Ministries, and so on- but it was created to be carefully separated from the means of coercive power. Then you have the TEV-DEM (The Democratic Society Movement), driven bottom up directly democratic institutions. Ultimately -and this is key- the security forces are answerable to the bottom-up structures and not to the top-down ones. One of the first places we visited was a police academy (Asayi?). Everyone had to take courses in non-violent conflict resolution and feminist theory before they were allowed to touch a gun. The co-directors explained to us their ultimate aim was to give everyone in the country six weeks of police training, so that ultimately, they could eliminate police. Well, I think most movements, faced with dire war conditions, would not nonetheless immediately abolish capital punishment, dissolve the secret police and democratize the army. Military units for instance elect their officers. Well, the President of Cizire canton is an Arab, head of a major local tribe in fact. I suppose you could argue he was just a figurehead. In a sense the entire government is. But even if you look at the bottom-up structures, it’s certainly not just the Kurds who are participating. I was told the only real problem is with some of the “Arab belt” settlements, people who were brought in by the Baathists in the ‘50s and ‘60s from other parts of Syria as part of an intentional policy of marginalizing and assimilating Kurds. Some of those communities they said are pretty unfriendly to the revolution. But Arabs whose families had been there for generations, or the Assyrians, Khirgizians, Armenians, Chechens, and so on, are quite enthusiastic. The Assyrians we talked to said, after a long difficult relation with the regime, they felt they finally were being allowed free religious and cultural autonomy. Probably the most intractable problem might be women’s liberation. The PYD and TEV-DEM see it as absolutely central to their idea of revolution, but they also have the problem of dealing with larger alliances with Arab communities who feel this violates basic religious principles. For instance, while the Syriac-speakers have their own women’s union, the Arabs don’t, and Arab girls interested in organizing around gender issues or even taking feminist seminars have to hitch on with the Assyrians or even the Kurds. It doesn’t have to be trapped in that “puritanical ‘anti-imperialist’ framework” you mentioned before, but what would you say to the comment that the West/ imperialism will one day ask Syrian Kurds to pay for their support. What does the West think exactly about this anti-state, anti-capitalist model? Is it just an experiment that can be ignored during the state of war while the Kurds voluntarily accept to fight an enemy that is by the way actually created by the West? Oh it is absolutely true that the US and European powers will do what they can to subvert the revolution. That goes without saying. The people I talked to were all well aware of it. But they didn’t make a strong differentiation between the leadership of regional powers like Turkey or Iran or Saudi Arabia, and Euro-American powers like, say, France or the US. They assumed they were all capitalist and statist and thus anti-revolutionary, who might at best be convinced to put up with them but were not ultimately on their side. Then there’s the even more complicated question of the structure of what’s called “the international community,” the global system of institutions like the UN or IMF, corporations, NGOs, human rights organisations for that matter, which all presume a statist organisation, a government that can pass laws and has a monopoly of coercive enforcement over those laws. There’s only one airport in Cizire and it’s still under Syrian government control. They could take it over easily, any time, they say. One reason they don’t is because: How would a non-state run an airport anyway? Everything you do in an airport is subject to international regulations which presume a state. Do you have an answer to why ISIS is so obsessed with Kobane? Well, they can’t be seen to lose. Their entire recruiting strategy is based on the idea that they are an unstoppable juggernaut, and their continual victory is proof that they represent the will of God. To be defeated by a bunch of feminists would be the ultimate humiliation. As long as they’re still fighting in Kobane, they can claim that media claims are lies and they are really advancing. Who can prove otherwise? If they pull out they will have admitted defeat. Well, do you have an answer to what Tayyip Erdogan and his party is trying to do in Syria and the Middle East generally? I can only guess. It seems he has shifted from an anti-Kurdish, anti-Assad policy to an almost purely anti-Kurdish strategy. Again and again he has been willing to ally with pseudo-religious fascists to attack any PKK-inspired experiments in radical democracy. Clearly, like Daesh (ISIS) themselves, he sees what they are doing as an ideological threat, perhaps the only real viable ideological alternative to right-wing Islamism on the horizon, and he will do anything to stamp it out. On the one hand there is Iraqi Kurdistan standing on quite a different ideological ground in terms of capitalism and the notion of independence. On the other hand, there is this alternative example of Rojava. And there are the Kurds of Turkey who try to sustain a peace process with the government… How do you personally see the future of Kurdistans in short and long terms? Who can say? At the moment things look surprisingly good for the revolutionary forces. The KDG even gave up the giant ditch they were building across the Rojava border after the PKK intervened to effectively save Erbil and other cities from IS back in August. One KNK person told me it had a major effect on popular consciousness there; that one month had done 20 years worth of consciousness raising. Young people were particularly struck by the way their own Peshmerga fled the field but PKK women soldiers didn’t. But it’s hard to imagine how the KRG territory however will be revolutionized any time soon. Neither would the international powers allow it. Although democratic autonomy doesn’t seem to be clearly on the table of negotiation in Turkey, The Kurdish Political Movement has been working on it, especially on the social level. They try to find solutions in legal and economic terms for possible models. When we compare let’s say the class structure and the level of capitalism in West Kurdistan (Rojava) and North Kurdistan (Turkey), what would you think about the differences of these two struggles for an anti-capitalist society -or for a minimised capitalism as they describe? I think the Kurdish struggle is quite explicitly anti-capitalist in both countries. It’s their starting point. They’ve managed to come up with a kind of formula: One can’t get rid of capitalism without eliminating the state, one can’t get rid of the state without getting rid of patriarchy. However, the Rojavans have it quite easy in class terms because the real bourgeoisie, such as it was in a mostly very agricultural region, took off with the collapse of the Baath regime. They will have a long-term problem if they don’t work on the educational system to ensure that a developmentalist technocrat stratum doesn’t eventually try to take power, but in the meantime, it’s understandable they are focusing more immediately on gender issues. In Turkey, well, I don’t know nearly as much, but I do have the sense things are much more complicated. During the days that the peoples of the world can’t breathe for obvious reasons, did your trip to Rojava inspire you about the future? What do you think is the “medicine” for the people to breathe? It was remarkable. I’ve spent my life thinking about how we might be able to do things like this in some remote time in the future and most people think I’m crazy to imagine it will ever be. These people are doing it now. If they prove that it can be done, that a genuinely egalitarian and democratic society is possible, it will completely transform people’s sense of human possibility. Myself, I feel ten years younger just having spent 10 days there. With which scene are you going to remember your trip to Cizire? You are sometimes criticized for being too optimistic and enthusiastic about what’s happening in Rojava. Are you? Or do they miss something? I am by temperament an optimist, I seek out situations which bear some promise. I don’t think there’s any guarantee this one will work out in the end, that it won’t be crushed, but it certainly won’t if everyone decides in advance that no revolution is possible and refuse to give active support, or even, devote their efforts to attacking it or increasing its isolation, which many do. If there’s something I’m aware of, that others aren’t, perhaps it’s the fact that history isn’t over. Capitalists have made a mighty effort these past 30 or 40 years to convince people that current economic arrangements – not even capitalism, but the peculiar, financialised, semi-feudal form of capitalism we happen to have today- is the only possible economic system. They’ve put far more effort into that than they have into actually creating a viable global capitalist system. As a result the system is breaking down all around us at just the moment everyone has lost the ability to imagine anything else. Well, I think it’s pretty obvious that in 50 years, capitalism in any form we’d recognise, and probably in any form at all, will be gone. Something else will have replaced it. That something might not be better. It might be even worse. It seems to me for that very reason it’s our responsibility, as intellectuals, or just as thoughtful human beings, to try to at least think about what something better might look like. And if there are people actually trying to create that better thing, it’s our responsibility to help them out. This entry was posted in Commentary, News blog and tagged anarchism, David Graber, Janet Biehl, Rojava. Bookmark the permalink.